ASUS introduces its Vivo Tab and Vivo Tab RT, two upcoming Windows 8 tablets. ASUS, a global leader in the new digital era, today announces two incredible new tablets intended to run Windows 8. First unveiled at Computex in June, the ASUS Vivo Tab and ASUS Vivo Tab RT (formerly known as the ASUS Tablet 810 and ASUS Tablet 600 respectively) open up a new world of mobile possibilities and transform expectations about what tablets can do. With a name taken from the Latin verb â€œto liveâ€, Vivo is designed as a constant companion that blends the familiar elegance of ASUS tablet design with Microsoft Corp.â€™s new touch-enabled Windows 8 operating system. 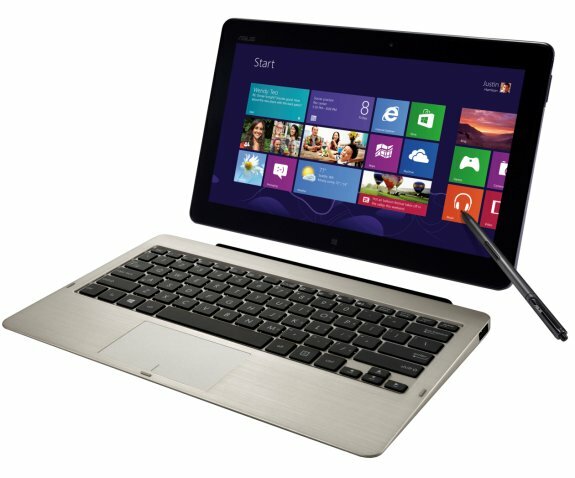 Vivo has a dual-purpose design that combines a high-resolution multi-touch Super IPS+ display with a detachable QWERTY keyboard dock to provide a great Windows 8 experience. ASUS TruVivid technology with CorningÂ® Fit Glass gives improved colour clarity and superior scratch resistance, while the keyboard not only transforms Vivo into a convenient clamshell ultraportable, but also provides a secondary battery for prolonged mains-free use. With an 11.6â€ screen backed by high-precision Wacom digitiser stylus technology, the Vivo Tab is designed with productivity in mind, while the ultra-light Vivo Tab RT is ideally suited to entertainment on the go. Get more done, enjoy new experiences and connect with others in exciting new ways â€” Vivo makes it all possible. The ASUS Vivo Tab features the Next Generation IntelÂ® Atomâ„¢ processor and has 2GB RAM with 64GB eMMC (embedded multimedia card) user storage. An incredible Windows 8 experience makes it a smart choice for professional and personal use. With support for 1024-level Wacom digitizer for precise work and navigation, ASUS Vivo Tab maximizes productivity and provides the best input experience. Key to the Vivo Tabâ€™s recipe for Windows 8 is the supplied mobile dock. This instantly transforms the tablet into a compact clamshell ultraportable, complete with full QWERTY keyboard, trackpad, two USB ports and second battery for extended use away from the mains. The 11.6â€ display with a 1366 x 768 resolution uses Super IPS+ technology to deliver superior visual clarity both indoors and out, and its 10-point multi-touch is complemented by Wacom digitiser stylus technology for high-precision stylus input and a more natural writing experience. Despite its compact dimensions and ultra-thin 8.7mm and 675g profile, the Vivo Tab still delivers superlative sound quality, thanks to the same SonicMaster technology used on ASUSâ€™ award-winning notebooks. High-quality photographs can also be captured with the 8-megapixel rear camera with autofocus and LED flash, along with a 2-megapixel front-facing camera for video chats. The Vivo Tab also features a built-in NFC sensor, enabling the device to easily sync with other NFC-enabled devices. The ASUS Vivo Tab RT has a slim and light profile thatâ€™s 8.3mm thin and 520g light. It features the NVIDIAÂ® TegraÂ® 3 quad-core processor and 12-core GPU for outstanding mobile graphics performance, along with 2GB RAM and 32GB eMMC user storage. Supplied with Windows RT, tablet users with entertainment in mind will find a great partner in the Vivo Tab RT. The Vivo Tab RT also has the same innovative Transformer design as the Vivo Tab and is supplied with its own mobile dock that provides a QWERTY keyboard, track pad, USB port and built-in battery. Windows 8 apps, games and movies will look incredible on the Vivo Tab RTâ€™s 10.1â€ display with 1366 x 768 resolution and Super IPS+ technology, while ASUS SonicMaster technology ensures top-quality audio. The Vivo Tab RT has the same high-quality front and rear cameras as the Vivo Tab too, making it an excellent all-round multimedia performer. It also features a built-in NFC sensor, enabling the device to easily sync with other NFC-enabled devices.